We've been a fan of Matthew Paulson, a Florida-based photographer, ever since we came across his work on Google+. We were delighted to see that he had taken a recent visit to the Dry Tortugas National Park, and Fort Jefferson to take photos, and he didn't disappoint with his creative flair. Please welcome Matthew as he walks us through his visit, and what he discovered up arriving and departing the island. "It has been a few years, but my trip to Dry Tortugas National Park is still one of my favorite adventures. This post is mostly about my experience visiting the park, but I will give a little background. Dry Tortugas National Park is one of the most remote National Parks in the park system. It consists of a small group of islands located approximately 70 miles west of Key West. The main island is Garden Key which hosts Fort Jefferson and is where I camped. The islands are only accessible by boat or floatplane. I actually got the full experience and did both on the same trip. On my first day I took a seaplane flight from Key West airport out to Garden Key. This was my first flight in a seaplane and it was great for seeing the crystal clear water and even a shipwreck on the way out. The highlight of the flight for me was getting to capture a few shots of Fort Jefferson from the air just before we landed. I got my first taste of Fort Jefferson and spent some time exploring and getting the lay of the land. I also took quite a few pictures of course. The downside of going on the floatplane is you only get a few hours on the island. Then next morning I was on the ferry back to the park. The ferry ride is longer and not as scenic, but still is enjoyable. I camped on Garden Key for two nights. To camp you have to carry in and out all of your gear including food/drinks/shelter/etc. The fort closes at sunrise and you pitch your tent just off the beach. I enjoyed the camping although I was not a big fan of the very windy conditions while I was there. The best part about camping was that after the day trippers left, there were only a few people left on the island. There was plenty of stuff to do while on the island. One of the days I took the tour provided by one of the ferry boats. That was interesting and nice to get some of the historical perspective. I did a little swimming around the walls of the fort. The water is pretty clear so this would be a great place to do a little snorkeling. There were a lot of different kinds of fish in the structures around the fort. I spent a lot of time exploring Fort Jefferson. I loved walking the walkways that surround the fort. You have the crystal clear water on one side and then a moat on the other side between you and the fort. I also enjoyed walking around the top of the fort. This gives you an elevated view of the area and was even a great place to sit and read. Fort Jefferson also has its own lighthouse, Garden Key Light. You can also see the Loggerhead Key Lighthouse (although you need a telephoto lens to capture it) from Fort Jefferson. My favorite photo of the trip was of the setting sun next to the Loggerhead Key Lighthouse. 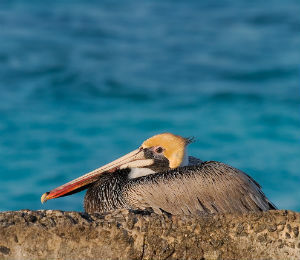 One of the other main reasons people travel to the Dry Tortugas is for bird watching. The reason the bird watching is so good here is that many birds stop here to rest during migration in spring and fall. This affords you the opportunity to see a lot of different species in a short amount of time that would be more difficult to see on the mainland. There is a water fountain that has been installed inside the fort which gives the birds access to fresh water (The islands were named the “Dry” Tortugas due to the lack of freshwater and the many turtles.) If you hang out around the fountain area during the migration there is a good chance for you to see a good variety of birds. I am not an avid bird watcher, but I can identify most native Florida species and enjoy seeing new birds. My favorite birds to watch while on the island were the Magnificent Frigatebirds. There were a ton of Magnificent Frigatebirds flying over the fort all day long. Two species that I got to see for the first time were Brown Noddies and Sooty Terns. These species nest on nearby Bush Key from April to September. It is a sight to see at sunrise as they all take to the air in the morning light. As a photographer there were so many angles and viewpoints to capture that I was kept busy looking for new shots. For me the biggest bonus of being on the island overnight was I got to stay to see two sunsets and two sunrises. During the day I photographed the fort and the birds. I also happened to be there during a full moon which added some additional photo opportunities. Since it is so far away from a big city I really want to go back to try some night sky photography. And if somehow none of that appeals to you, then you can just hang out and relax…." Visit Matthew Paulson's Photography website to learn more about him, and see his beautiful work.